The stack (ingredients on the right) was ingested twice daily. It has been a while since the last study on sodium bicarbonate’s usefulness has found its way to the SuppVersity. And, technically speaking, the latest RCT by scientists from the Department of Sports Training at the Jerzy Kukuczka Academy of Physical Education in Katowice, Poland, and colleagues from the Miller School of Medicine, at the University of Miami is a “bicar-bonate”, but not a “sodium bicarbonate” study. How’s that? 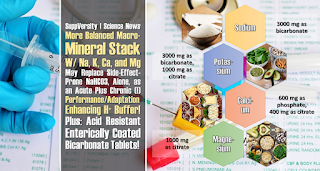 Well, the scientists did exactly what some of you have already suggested: They combined sodium- and potassium-bicarbonate (the authors write di-carbonate, which is obviously the same) at a dosage of 3g, each, to achieve a balance between the two macro-minerals and topped the bicarbonates up with 1000 mg (600 mg + 400 mg) calcium phosphate and calcium citrate, 1000 mg potassium citrate, and 1000 mg magnesium citrate. So, basically one macromineral stack 90 minutes before each training for 9 days – with the last “training” actually being the sprint test. With “only” 6g of sodium- and potassium-bicarbonate the stacks were dosed comparatively low compared to the 0.3g/kg protocols that have been used in many of the preview studies. The dosage is, however, in line with previously discussed “serial-loading” studies where NaHCO3 was administered in repeated smaller doses over 24h or several days (see this previous article) to achieve the desired alkalizing effect with a reduced risk of gastrointestinal distress. Yes, the diet was standardized: The participants were placed on an isocaloric (3455 ± 436 kcal/day) mixed diet (55% carbohydrates, 20% protein, 25% fat) prior to and during the investigation. The pre-trial meals were standardized for energy intake (600 kcal) and consisted of carbohydrate (70%), fat (20%) and protein (10%). The participants did not take any medications and substances not prescribed by the supplementation protocol for 3 weeks before and during the study. The latter was further reduced in the study at hand by administering the supplements in 500mg capsules – a practice of which I’ve previously pointed out that it seems to (a) limit the gastrotestinal distress an (b) help those of you who hate the salty taste of pure NaHCO3. Table 1: The authors found statistically significant differences between baseline and post-intervention period at rest, post ingestion, and after exercise for the experimental group for all parameters| Note: d, effect size (≥ 0.5 = LARGE effect – found for all parameters); p, statistical significance; F, value of analysis of variance function (Chycki 2018). Next to the performance test, Chycki et al. (2018) also tested the subjects’ lactate concentration (LA), acid–base equilibrium and electrolyte status, the following variables were evaluated: LA (mmol/L), blood pH, pCO2 (mmHg), pO2 (mmHg), HCO3− act (mmol/L), HCO3− std, (mmol/L), BE (mmol/L), O2SAT (mmol/L), ctCO2 (mmol/L), Na+ (mmol/L), K+ (mmol/L), and Ca2+, Mg2+. The measurements were performed from fingertip capillary blood samples at rest and after 3 min of recovery… and guess what!? “Large effects” (Cohen’s d > 0.5) were observed for all of these. Those of you who haven’t read that many SuppVersity articles, yet, must also be aware that “Cohen’s d” as a measure of the effect size does not say that this is “large” = “practically relevant” difference. The paper has issues in terms of data reporting: As pointed out in the main body of this article, the figure with the sprint times does not align with the values reported in the text of the paper. For the given reason (unrealistic improvements, hardly legible captions, etc.) I rely on the explicitly stated sprint times in the experimental and an extrapolation of the corresponding data in the placebo trial. I believe that this represents the data appropriately, but I cannot guarantee that. I have to emphasize once more While this can be (and often is) the case, it only tells you that the inter-group difference was large even when the standard deviations are considered. 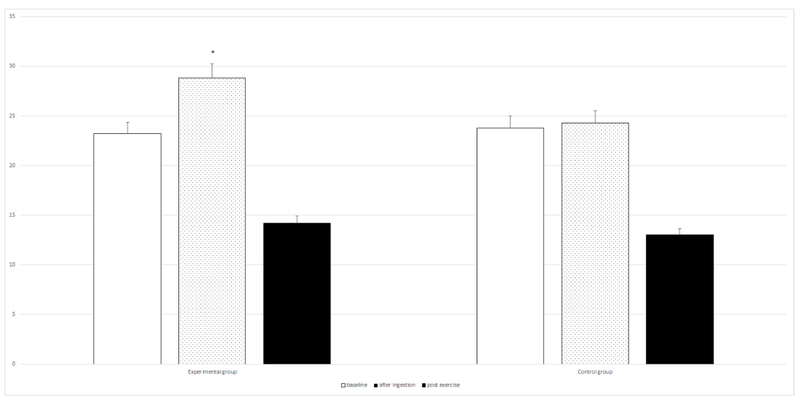 Figure 1: Sprint performance times in seconds before and after the 9-day training + supplementation intervention in the experimental vs. placebo group; left: with a similarly messed up vertical axis scale as in the original from the study / right: with a transparent vertical scale that shows that the statistical “effect size” is large, the relative improvement, on the other hand, rather low [†Note: I cannot guarantee that the data is 100% accurate, because the plotted and discussed data in the stud at hand contradict each other and I had to extrapolate the non-reported absolutes for the placebo group]. Since the scientists’ plot of the data is totally messed up (click here to see it), I had to redo the graph for the sprint times based on the values given in the text, i.e. 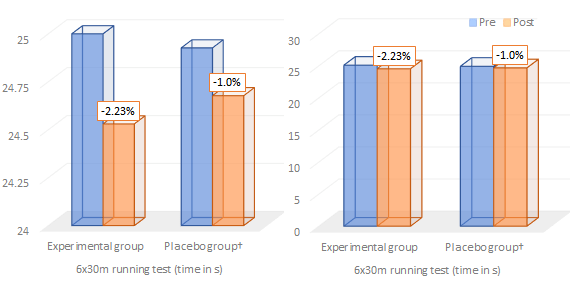 the 6 × 30 m running test improved from by 2.3% 25.09 s to 24.53 s (p = 0.00001) in the experimental group and by only non-significant 1% in the control group (I extrapolated the absolute values in the control group, which were not reported from inter-group difference in the scientists’ own IMHO wrongly labeled graph). Furthermore, I decided to give you both, the equivalent of the scientists’ own plot which uses a scale that totally exaggerates the improvement (Note: the original captions cannot be correct, because then, the sprint times would have improved by ~50% – that’s unrealistic and not in line with any of the other data reported in the text) and my “fair” plot, from which you can see that the real-world effect is not exactly as large as a misinterpretation of “large effect sizes” would suggest. I actually wonder that acid resistant NaHCO3 tablets have not been marketed, already, as a more stomachable al-ternative to classic powders or caps, which will release their content in the gut where it will react with the stomach acid and produce bloating or worse. Moreover, with the publication of a recent study from the Univer-sity of São Paulo in which the scientists investigated the buf-fering effect of NaH-CO3 in post-gastric bypass patients and found (a) sign. reduced side effects and (b) a signif. increased effect on blood pH, we do have initial evidence that allowing the tablets to pass through the stomach undigested, may not just avoid the runs, it may also re-duce the dosage you need to see an effect, signif. – or, as the authors put it: “Maximal bicarbonate increases were well above those shown previously, with minimal side effects, indicative of minimal neutralization of bicar-bonate in the stomach.” (de Olivera 2018). What does the study tell us? Yes, the 2% performance benefit doesn’t sound like much, but during an actual soccer match those +2% sprint performance can make the difference between getting and missing a long ball and hence scoring a goal or seeing the goalkeeper punt. (2) This is the first study to suggest that chronic K-/Na-bicarbonate supplementation may enhance the training effect trained athletes can derive from a relatively short training camp. This does also suggest that buffering effects of bicarbonates, phosphates, and citrates do not impair (keyword: “hormesis“), but rather promote the training effect. (3) This is the first study to suggest that addition of the magnesium and calcium citrate, both deficiency nutrients in the general population, doesn’t impair the performance benefits of bicarbonates. Why would it? Well If you’ve ever tried to mix bicarbonates and citrates you will know that the two will react with each and release carbon-dioxide. This, in turn, would leave less bicarbonate to pass into the bloodstream to work its buffering magic there (note: in the absence of a KHCO3+NaHCO3 only group, it’s still possible the that either the reaction between bicarbonates and citrates or the mere presence of Mg and Ca could have reduced the performance effects of the bicarbonate stack). For those of you who didn’t notice that already – the use of the word “suggests” in (2)+(3) does exactly what it means: it “suggests” that future studies should investigate individual and synergistic effects of the dynamic macronutrient quartett w/ Na, K, Ca, and Mg | Comment! Chycki, Jakub, et al. “Chronic Ingestion of Sodium and Potassium Bicarbonate, with Potassium, Magnesium and Calcium Citrate Improves Anaerobic Performance in Elite Soccer Players.” Nutrients 10.11 (2018): 1610. Luft, Friedrich C., et al. “Sodium bicarbonate and sodium chloride: effects on blood pressure and electrolyte homeostasis in normal and hypertensive man.” Journal of hypertension 8.7 (1990): 663-670.